The Chilkat Preserve is one of the best places in the world to find American bald eagles—thousands congregate there to feed on salmon during the fall and winter. 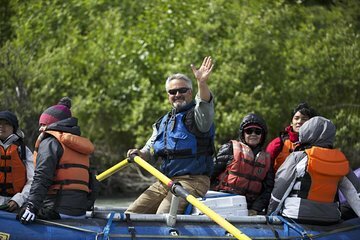 This tour takes you on a scenic rafting trip along the Chilkat River—where the eagles put up residence during the summer—and provides the wilderness knowhow to spot the birds and other animals while navigating the river’s channels. Though the experience was really a float tour, our guide was amazing. We loved the beauty and the abundance of wildlife and local tales. A great trip but note you are not paddling- just relaxing... very nice. This was a wonderful trip. The boat ride to and from Haines from Skagway was beautiful and informative. Byrne did a great job of checking us in and driving us to and from the river. Ashley was amazing as our raft guide, giving us plenty of information about the nature. We saw many mature eagles, some babies and multiple nests. The views were spectacular even though the day was overcast. We loved having a boat for just the four of us! The tours booked through the ship had from twelve to sixteen on each boat. This was a far more personal experience!! !